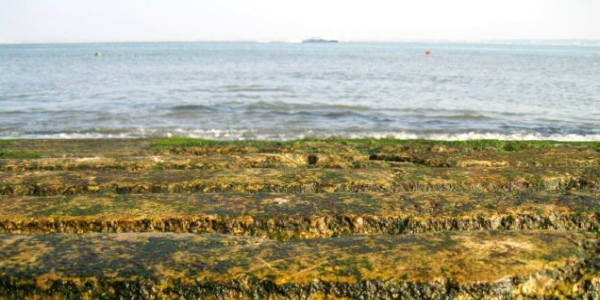 This course is primarily intended for experts from operational centres with responsibility of monitoring seas on the Atlantic coasts, and Mediterranean Sea. Analyse the current surface conditions using scatterometer and altimeter data. Monitor the evolution of the surface conditions. Integrate these satellite data with data from numerical models, validating the model output. Access and visualise the data. Identify how the use of the wide range of products available from EUMETSAT, the Copernicus Marine Environment Monitoring Service, and other Copernicus partners, can improve the quality of marine analysis. This is a blended course, composed of a two-week online phase and a five-day face-to-face phase. Find out more about the event in the Training Calendar and register by mid-January. 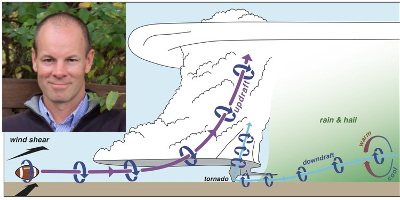 ESSL’s advanced-level course on forecasting severe convection in 2018 will be given by Prof. Paul Markowski, renowned tornado and mesoscale meteorology scientist from Pennsylvania State University. The lectures target meteorologists with prior forecasting experience of synoptic-scale weather and prior exposure to the fundamentals of atmospheric dynamics. The lectures will cover the dynamics and prediction of severe thunderstorms and their attendant hazards, drawing upon the body of understanding obtained from decades of prior theoretical, observational, and numerical modelling studies, as well as the latest, state-of-the-art strategies in use today. Topics include convection initiation, the influence of the environment on convective storm mode, isolated convective storms, convective systems, large hail, tornadoes, damaging straight-line winds, and ingredients-based forecasting. The seminar includes hand-on forecasting exercises during the afternoons. At the end of the week, participants may choose to take part in an examination. Participants that pass this examination receive a Testimonial. Registration is possible by mid-December 2017 on the website of ESSL. The key objective of this workshop is to instruct active and future users from National Meteorological Services and research institutions in the use of CM SAF products for operational climate monitoring and climate research. During the a two-week online phase, prior to the workshop, participants will be introduced to the concept of satellite-based climate monitoring and will be asked to design a mini project which they will be working on during the classroom phase. The projects will be finalised during the workshop in Riga (14–18 May, 2018), with the aim of exploring satellite-based climate monitoring data and familiarising themselves with different software tools. This will also include supporting presentations and group work on the application of satellite to climate monitoring. During the workshop, the participants will have the opportunity to explore the use of CM SAF data in their daily work. For more information and to apply, check the EUMETSAT Training Zone. 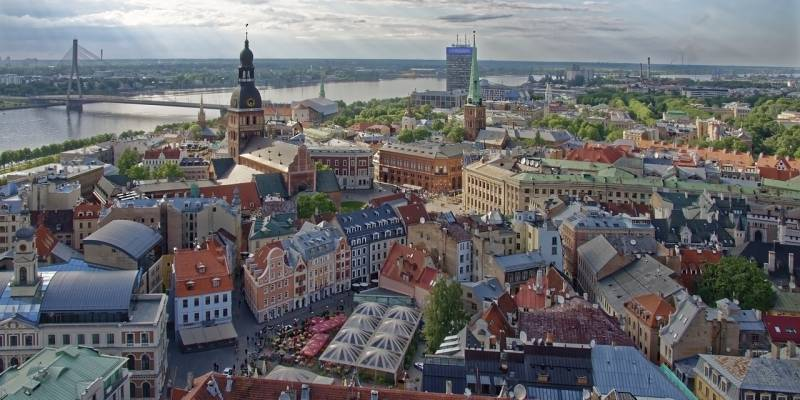 Next year’s Eumetcal Workshop will be held during the last week of August in Riga, Latvia. The workshop’s theme will be published in the beginning of 2018. Please check on the Eumetcal website for updates about the workshop and other activities. 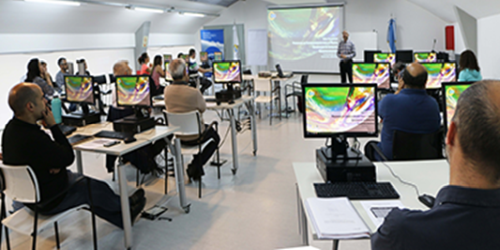 The workshop is aimed at trainers, training developers and educators in meteorology. The week will provide the opportunity to meet and discuss the latest training issues within this community. 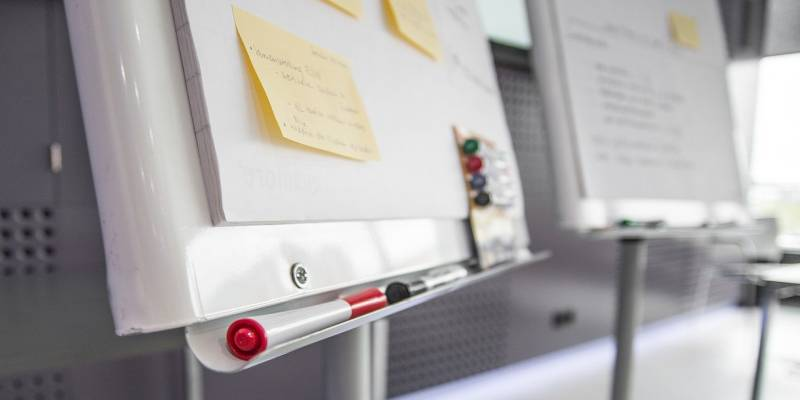 This year, the WMO Education and Training Office, in collaboration with ENM-Météo-France, will be offering the Online Course for Trainers for Francophone trainers, training managers, and part-time trainers. This course will be offered completely in French, and francophone participants from all WMO regions are being invited to attend. Are you interested in sharpening your training skills? Meeting other trainers to learn how they conduct their work? Engaging in discussions, debates, and other exercises to deepen your understanding and expand your ideas about training processes? The online course will allow participants to develop their skills in each of the WMO Competencies for Education and Training Providers. It will be offered as a nine-week course, in three modules with two two-week breaks (a total of 13 weeks), beginning in early March with pre-course activities. The goal of this online course, in particular, is to help trainers at all levels of responsibility to increase their knowledge and skills in planning, developing, delivering, assessing, and evaluating training. Participant nomination forms will be made available in January 2018, and completed forms need to be received by the WMO Secretariat in February 2018. All Francophone RA-VI members are encouraged to participate. Mark Higgins, Training Manager at EUMETSAT, said: 'We made these as a direct response to feedback that people would like really short and focused introductions to the RGBs. We hope they will fit nicely with the RGB quick guides that EUMeTrain are working on and will publish soon. I would love your feedback. You can comment directly on YouTube or email training@eumetsat.int.'. 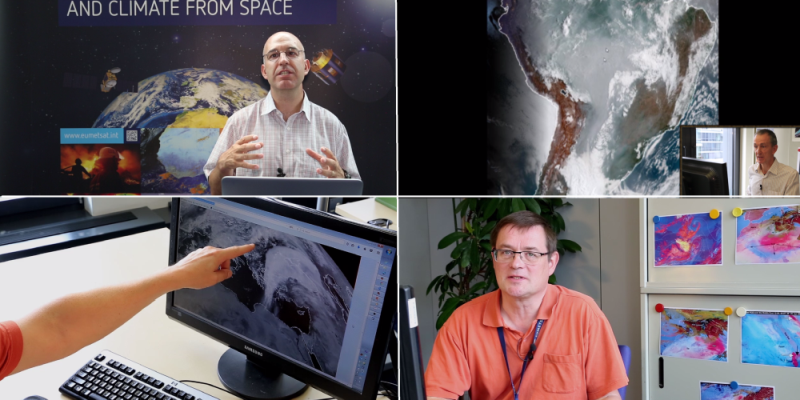 Find the videos and a lot more on the EUMETSAT YouTube channel. 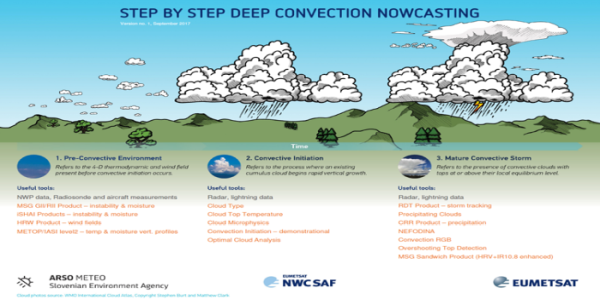 How do you nowcast convection? What is your step-by-step process? The Convection Working Group (CWG) has been working on a guide that gives an overview of available products for monitoring convection in its different phases: 1) Pre-convective environment, 2) Convective Initiation and 3) Mature Convection. The guide aims to bring satellite products, which are important for monitoring convection, closer to forecasters. It is a small, but important, step to bridge the gap between research and operations. Find the guide here. Keep in mind that this version is 'in progress'. The CWG group will be continuously working on enriching it and adding more products to the catalogue. EUMETSAT has just updated its training calendar. 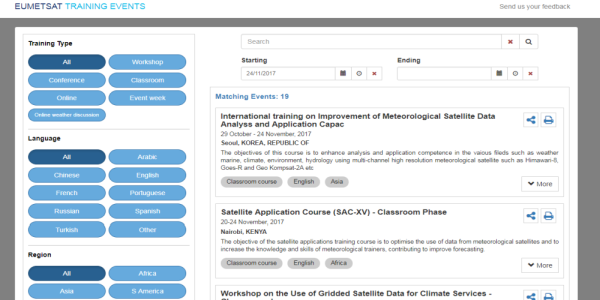 All EUMETSAT supported training events are listed, plus those from other satellite training providers, as part of the WMO-CGMS VLab. To meet the training needs of Member and Co-operating States, ECMWF has started a project to produce a set of publicly-available eLearning modules, initially on foundational material for our numerical weather prediction, software and product courses. The first two ECMWF eLearning modules, on Convection and Metview, were launched in May 2017 and others will follow later this year. A set of online modules covering NWP topics, software, ECMWF meteorological archive and Metview (visualisation) is now freely available on the ECMWF website. More modules will be added in the coming months. More information on the project can be found in the ECMWF newsletter article 'ECMWF launches eLearning'. 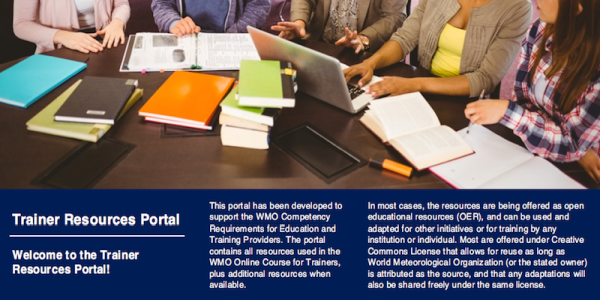 Since September 2017, the resources used in the WMO Online Course for Trainers have been available for all WMO Members at the Trainer Resources Portal. These resources, organised by the six competency units of the WMO framework, have been developed and updated by a group of professionals contributing to the WMO Online Course for Trainers since 2014. All resources are well researched, based on a solid foundation of training literature and the years of experience of those who offer them. They are being offered under a Creative Commons open copyright license that requires only attribution of the source for their reuse, and allows for free adaptation to meet the unique needs of users. The portal will eventually be available in four languages: Spanish, French, Russian, English. This portal is not intended to replace the facilitated course that is currently offered each year, but provides alternative paths to competency development for trainers. The effort to collect these resources within a user-friendly portal has been sponsored by the WMO ETR Office and the EUMETNET Eumetcal Programme, with the additional generous donation of time by WMO/CGMS VLab and EUMETSAT, as well as other WMO training partners. The WMO Trainer Resources Portal is available on the ETRP Moodle site, no login required, here. How and when would you like to receive your satellite news? Are you teaching people about satellite data or learning about it yourself? What would help you? Would you like to receive an email with all satellite-related training opportunities or would you rather join a Facebook group to stay in touch? Are you more interested in job opportunities, data and products news or would you rather receive more satellite image interpretations? 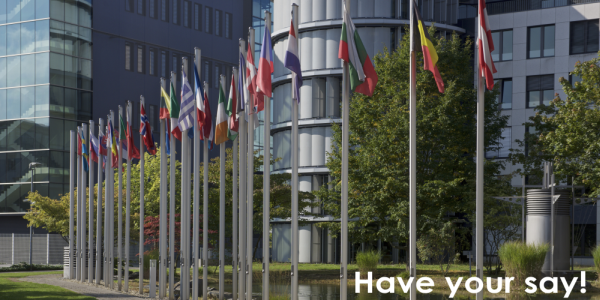 EUMETSAT and the EUMeTrain project want to make sure that you are informed about their activities, so you find the ones that are the most useful to you. Do not miss the opportunity to express your preference here. It will only take a few minutes. A training module on Metop AVHRR RGB images was published at the end of November 2017. 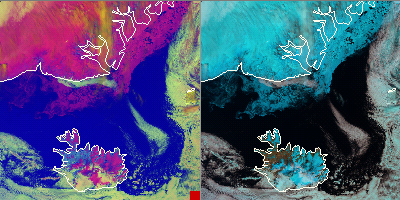 The RGBs were tuned to create good quality Metop/AVHRR RGB images, as similar to the EUMETSAT recommended SEVIRI RGB schemes as possible. How to create the given RGB type? After discussing the four RGB types separately the daytime RGBs are compared to each other, and the effect of the scanning geometry is also discussed. The main aim of the training module is to help the users (weather forecasters and other experts) to understand and use these RGB types by giving them background information, examples and exercises. A set of lecture recordings from the course Weather Radar Applications in Nowcasting for Weather Forecasters 2017 has been published on the Eumetcal Youtube channel. 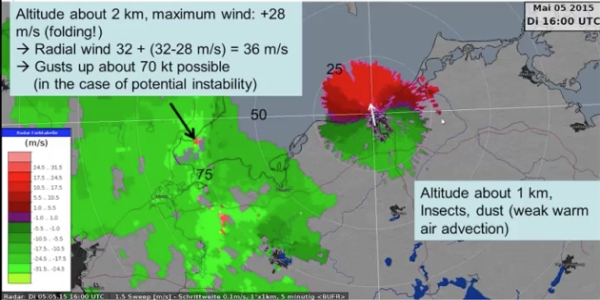 These videos start with basic principles of radar meteorology and go into examples of how weather radars can be used to detect different weather phenomena. By listening to the lectures you will become better able to correctly interpret radar images, diagnose relevant weather using weather radar products, and increase awareness of the potential of modern weather radars in the forecasting process. Once again the Summer School for satellite meteorology has been held in Bracciano, Italy. This time at a different time of the year, from the end of September to the beginning of October. 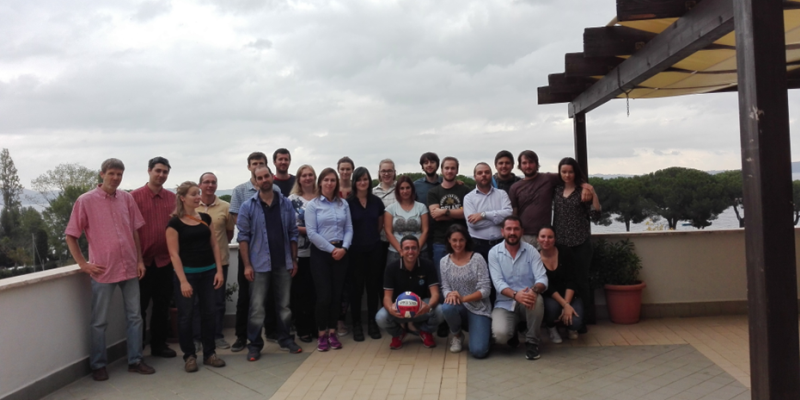 The teachers, Jochen Kerkmann (EUMETSAT), Ralf Bennartz (University of Wisconsin) and Davide Melfi (Italian Meteorological Service), were accompanied by new presenters, younger colleagues from the area of satellite meteorology: Michaela Valachova (CHMI) and Djordje Gencic (RHMSS). The participants came from all over Europe and from different fields of work, mostly general forecasters, but also military forecasters, researchers, etc. The lecture topics consisted of satellite single channels, channel differences, and RGB composites. Lectures in the morning and early afternoon were followed by a laboratory practice, in which specific events (fires, dust storms, convective clouds, etc.) were analysed using imagery from different satellites (geostationary, polar) and their combinations in a software called McIDAS-V. Also, students in this summer school used imagery from the new Himawari-8 satellite and tried to create RGBs similar to the ones that will be used with the new MTG satellite. 'As it was my first time attending the course as a student, I really enjoyed the practical work after lectures, which included fog, convection etc., which will prove useful during my daily work as a future forecaster at the met office in Zagreb. ', said Marko Blašković, a meteorologist in Zagreb. 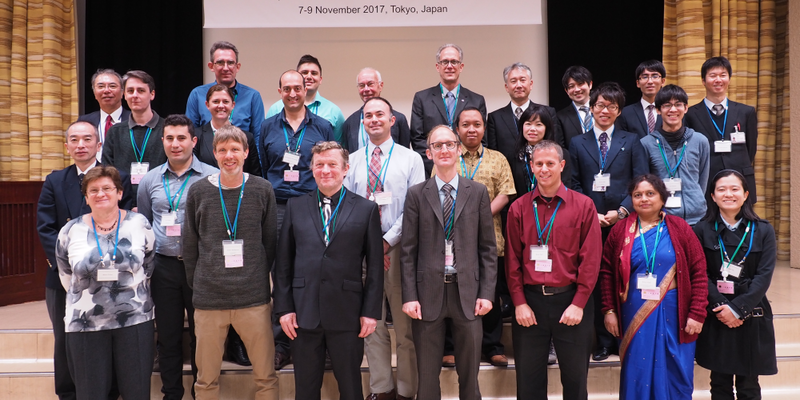 The third RGB Experts and Developers Workshop, jointly organised by WMO, the Japan Meteorological Agency (JMA), and EUMETSAT, hosted by JMA in Tokyo on 7-9 November 2017. The arrival of the new generation of advanced GEO imagers on Himawari-8/9 and GOES-16 (and soon from FY-4A, GEO-KOMPSAT-2A and MTG-I) has brought exciting times for forecasters who use multi-channel satellite imagery. 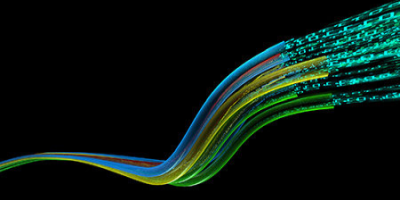 RGB composites have proven to be an excellent way of visualising the unique features of imagery, in terms of sampling and information content. RGBs reduce the complexity of multi-channel imagery, and, thereby, foster utilisation of satellite data in weather forecasting, air quality, marine, land, and related environmental applications. Expert workshops in Boulder (2007) and Seeheim (2012) were instrumental in agreeing a set of standard recipes for constructing RGB composites. The resulting standards, developed by EUMETSAT and recognised by WMO, have been reflected in product lines of new generation imagers, and have successfully guided applications, training and capacity building. They have also been valuable in scientific investigation, as well as in forecasting and operations. During the 2017 workshop, the standard RGB recipes and their applications were revisited by the expert community, and the value of RGBs in context (NWP, products) was demonstrated. Also, new demonstration and training material was compiled and put online. Last but not least, new standards for RGB composites were explored and will be summarised in the final report (to be distributed by WMO). Training activities focus on a single discipline and attract many experts from a field. 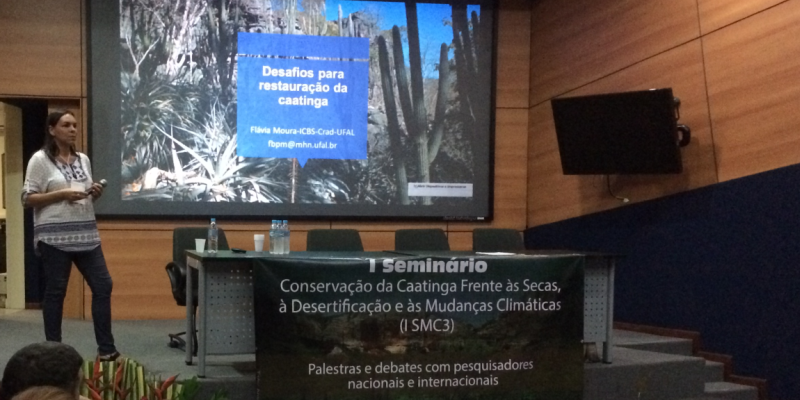 In this case however, the objective was to summon professionals from many fields, like biodiversity, agriculture, geology, law, computing, culture, space observation, meteorology and climate, to find solutions and sinergies for the ecoregion called Caatinga. Caatinga is a unique kind of vegetation adapted to the arid conditions in the north-east of Brazil, where millions of people exploit its limited resources. The 50+ participants included a group of students from the Federal University of Alagoas. They welcomed this mixed formula, enjoyed talking to experts from many areas, and were grateful for suggestions on a professional career. 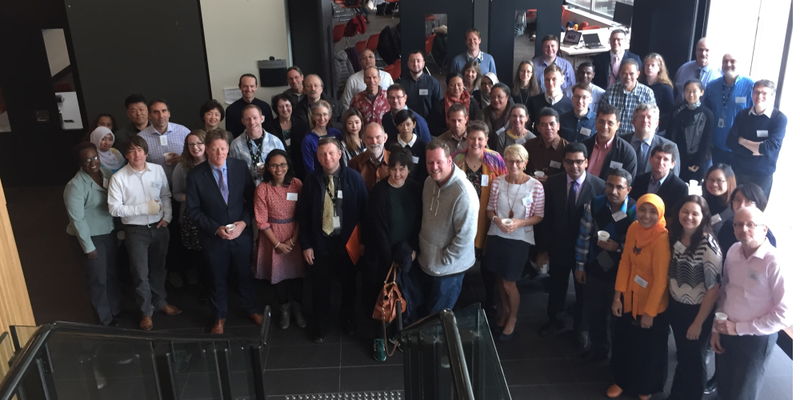 The CALMet community‘s in-person gathering took place 29 Aug-1 Sept 2017 in Melbourne, Australia, hosted by the Bureau of Meteorology Training Centre (ABoM). This was an excellent opportunity to spend four days sharing best practices in training for the meteorological, hydrological, and climate workforce. The presentations and other resources can be found on the Bureau of Meteorology Moodle site. Follow CALMet Commons at http://www.calmet.org/. The Workshop and training on dust observation and related initiatives were jointly organised in Istanbul supported by the Turkish government through the Directorate for Combating Desertification (CEM). The first part, with the format of a conference and with simultaneous English-Arabic-Turkish translation addressing ca. 80 participants. Topics covered included climate and drought implication of dust, variability of dust outbreaks, dust modelling and in particular the use of the Copernicus Atmosphere Monitoring Service (CAMS) as a privileged tool to monitor and forecast dust concentration around the world. Another session was devoted to health and agriculture, plus related socio-economic activities. 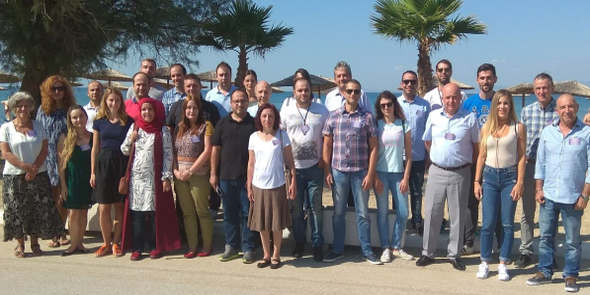 The second part of the week focused on training on dust observation and modelling, with the participation of about 20 students, mainly from Turkish Universities and Teheran - the site of the previous event in the series. The 9th international workshop on sand and dust storms was announced for 22-24 May 2018 (Tenerife, Spain) where more than 200 experts and users are expected. For a fifth time, this yearly school was convened by the Aristotle University of Thessaloniki and attracted participants from the region, in particular the Balkans, Africa and Middle East. The peaceful atmosphere around Nei Epivates was the setting for discussions on thermodynamics, conceptual models, lightning, mesoscale convection, the use and tuning of RGB and hydrology risks - to mention a few highlights of the programme. Nowadays, satellites offer a lot of information, which is converted in warnings and nowcasting insights. Still, the human skills for this task are developing, and open to lively debate. During the training, Veronika Zwatz-Meise from Vienna offered fresh ideas for the use of conceptual models in the assimilation of satellite imagery. She has been supporting EUMETSAT training for longer than 22 years. Other trainers from Greece, Italy, France, Spain, Austria, Bulgaria, plus Eumetsat contributed to the event. On the social side, a boat trip took to Thessaloniki was organised to enjoy the flavour of the Greek cuisine and hospitality. 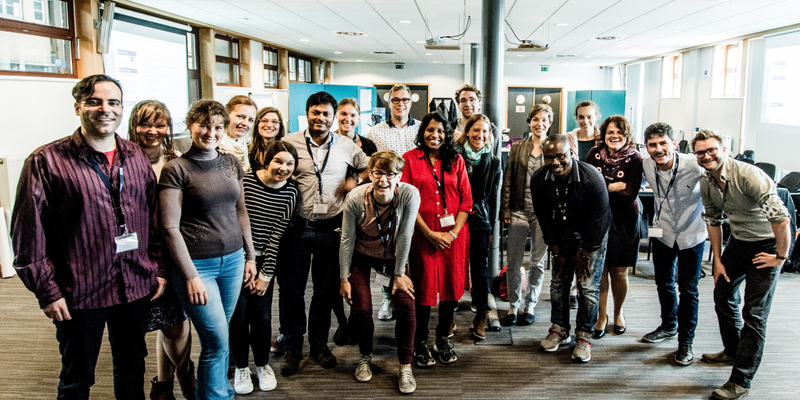 The classroom phase of the first Copernicus Marine Data Stream full training course was held at the International Oceanographic Data and Information Exchange at the Flanders Marine Institute in September. After completing a week-long online phase, participants met in person for five days of practical exercises, including group mind-mapping about the Copernicus programme and data from Sentinel 3 satellite, exploring satellite data using SNAP and BRAT software, and plotting using Python. Participants were encouraged to direct their own learning by developing and working on mini projects with the trainers. At the end of the week the participants all gave presentations of their work, which covered a diverse range of fascinating case studies — from ice edge dynamics and fisheries modelling for a new start up business, to water quality in Brazil and sea surface height associated with recent hurricane activity. An interactive feedback session gave the training team an excellent opportunity to get feedback on data access, data quality, and future training requirements to build and develop users of the exciting new data coming from Copernicus. 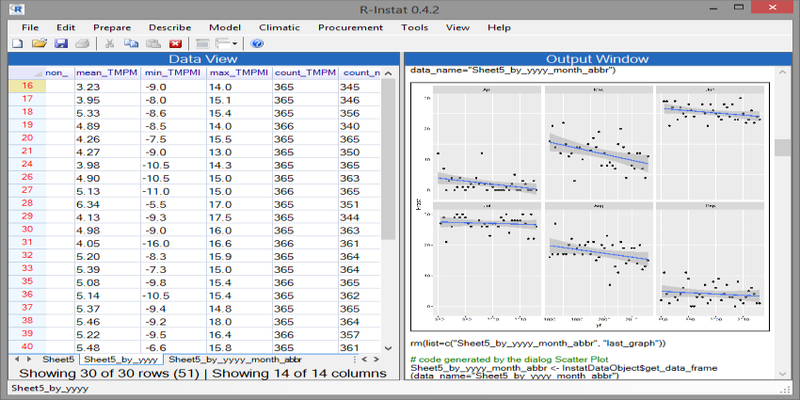 Following Instat, widely used in Africa for making climatological use of ground-based meteorological measurements, R-Instat is a software for beginners in statistics packages. Developed by Stats4SD, it is an important tool for climate training in Africa. CM SAF R Toolbox is a set of R scripts for processing statistical analysis of gridded data in R, for both time-series analysis of a single pixel and spatial analysis (mean, max, min, stddev, trends). It also includes ‘standard’ plotting functionalities needed in the context of analysing CM SAF, such as maps, scatterplots, line plots, histograms. To facilitate the use of CM SAF data and based on the importance of satellite climate monitoring data, an integration of CM SAF R Toolbox functionalities in R Instat was proposed. During a two-day workshop Prof. Roger Stern, Dr Danny Parsons, and Dr Sebastian Steinmüller, from Stats4SD, introduced the new R Instat software, with a special focus on the Climate Menu and the functionalities of the CM SAF R Toolbox. As a result, Stats4SD supported the EUMETSAT climate training course in Pretoria, South Africa, in November 2017. Further collaborations with Stats4SD will be explored in the context of integrated climate training. 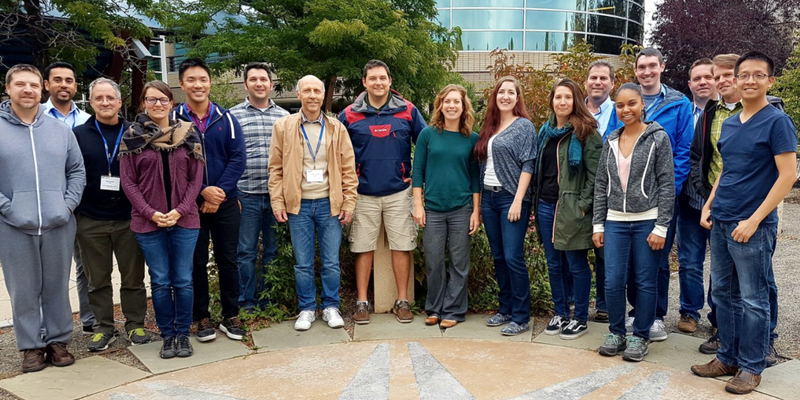 At the end of September 2017 a group of 16 excited operational meteorologists, with different operational backgrounds (aviation and general weather), participated in a two-week long Winter Weather Course (WWC) in Boulder, Colorado, USA. The Meteorological Service of Canada (MSC) and the Cooperative Program for Operational Meteorology, Education and Training (COMET) hosted the annual course. The mix of participants (13 from MSC, one from US National Weather Service, one from Finnish Meteorological Institute (FMI), and one from the Polish Institute of Meteorology and Water Management (IMGW-PIB)) strengthened the connections among international and national forecasters. The WWC is specifically designed for operational meteorologists, and focuses on atmospheric processes associated with winter season; both synoptic and mesoscale phenomena. One of WWC's focus areas is to improve forecasters’ three-dimensional understanding of the atmosphere. For that purpose, we did different exercises focusing on water vapor satellite images and Numerical Weather Predictions (NWPs). Moreover, the course applied alternative tools to help forecasters increase their forecasting confidence.